The SSP-3 Photometer is the central part of a complete stellar magnitude measurement system. A complete set of precision filters, data acquisition interfaces, detector size and adapter options are available to fit any need. Light enters the photometer through the 1.25-inch telescope adapter and is directed either to the focusing eyepiece or the detector by means of a flip-mirror. The 1-inch focusing eyepiece comes with diopter adjustment and illuminated reticule that precisely defines the detector field of view. After a star is centered in the reticle ring, the flip-mirror is rotated to expose the detector. It is important to note that, unlike a photomultiplier system, the image of the star falls on the detector plane; therefore, a Fabry lens is not used and the photometer can be used with any focal length telescope. A two position filter slider is mounted between the flip-mirror and the detector. Any pair of Johnson standard UBVRI or Clear filters can be factory mounted in a slider. Since the slider is easily pulled out of the photometer, sliders with other combinations of filters can be inserted. For most variable star observations, a single slider with B and V filters is recommended to begin with. Powered by a 9-volt rechargeable battery, the SSP-3 offers unencumbered use at the telescope without annoying power cords. A single night's charge gives approximately 5 hours of operation, and if the observing session demands it, the battery charger can be used to give continuous power during use. The signal from the detector is converted to a frequency for counting and read on 4-character LED display. The integration times of 1, 5 or 10 seconds and voltage-to-frequency converter gains of 1, 10 and 100 are easily set by the two button menu on the front panel. The SSP-3 has a serial output for connection to a PC serial (COM) port. The SSPDataq control and data acquisition program that comes with every unit operates all aspects of the photometer. It can record data for both fast and slow events and even perform a complete data reduction for B and V magnitudes based on the methods of Hendon and Kaitchuck for differential photometry. U, R and I data is not reduced by this program but are treated with the SSPData2. 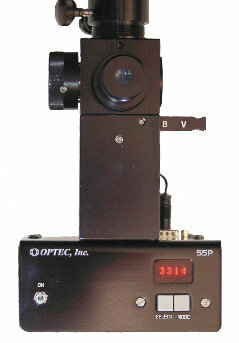 To fill the needs of APT (Automatic Photoelectric Telescope) users, a motorized 6-position slider can be added to the SSP-3 making it an SSP-3A. The performance of the SSP-3 can be seen on the graph above. The display output is expressed in counts per second vs. magnitude using the various filters. 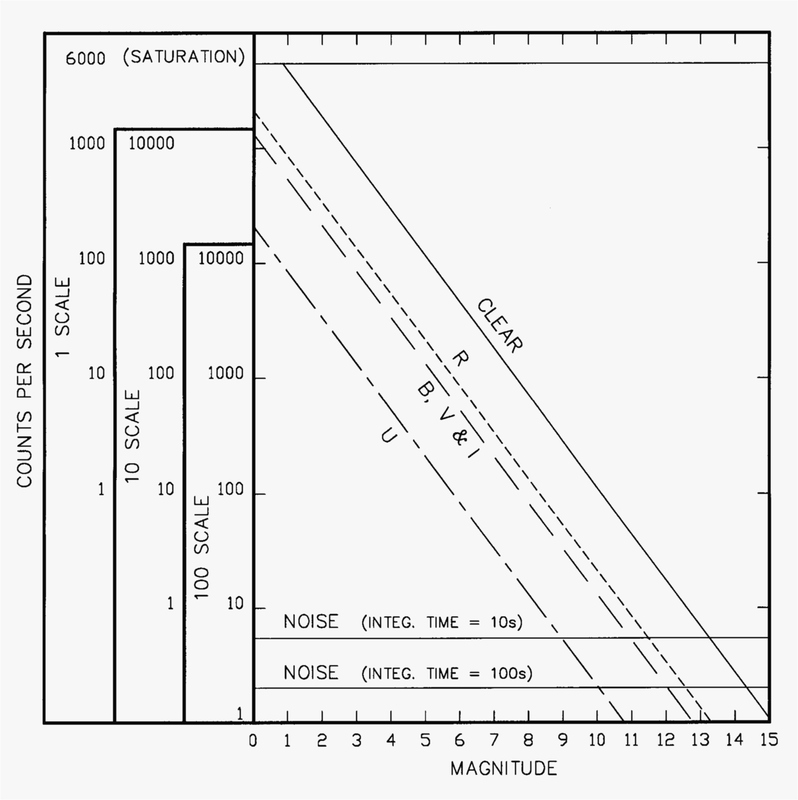 It should be noted that these are the approximate display counts, and that accurate magnitude should be determined using the accepted techniques of astronomical photometry. 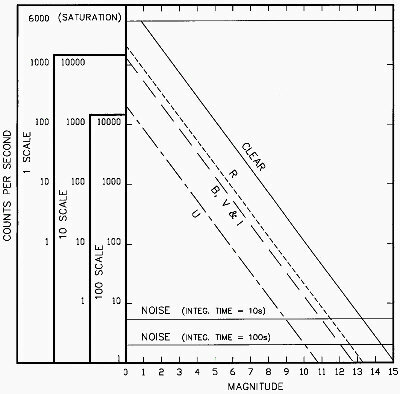 Each line on the chart represents the approximate relationship between stellar magnitude and counts from the SSP-3. The noise counts were determined by taking the standard deviation of 10 consecutive readings using either 1 or 10 second integration times. The intersection of the diagonal filter lines with the horizontal noise lines determine at what magnitude the signal-to-noise ratio is 1. Model SSP-3 Generation 2 Solid-State Photometer, Technical Manual for Theory of Operation and Operating Procedures, Revision 5 - June 2012. Download and print the SSP-3 Technical Manual for Theory of Operation and Operating Procedures.